It was with sadness we learnt of the passing away of one of St Cathryn’s most ardent supporters and most loved golfers, Liekie Steyn, who was a member from 2003 and also Ladies Club Champion from 2004 to 2016. We will remember Liekie for her wit, comments, aggressive golf fighting spirit and the most delicious, baked cakes for the golfers. Liekie was diagnosed with cancer during 2017 and fought a hard battle with this dreaded disease and she couldn’t par this tough course. 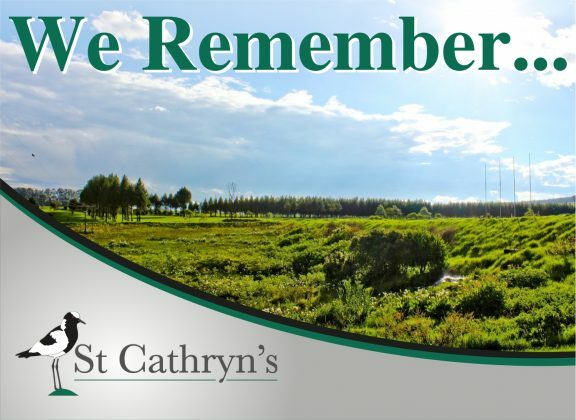 Liekie will be missed by all – our golfers, the fellow Home owners of St Cathryn’s, her colleagues and friends. A celebration of her life will be held at St Cathryn’s on Sunday 16 December 2018 at 12:00 for 12:30. All golfers are reminded of the first Farmers Agri-care Monthly Mug will be played this coming Saturday 15 December 2018, with the members report back meeting at 17h00 and members dinner thereafter. The new subs for the coming year are R 1650.00 for Men and Ladies, Students and Scholars are R 1150.00. All golfers will play with a black arm band in honour of our member Liekie. Saturday’s Farmers Agri- care monthly mug will be the first in the 2019 golfers Grand Prix. Sunday morning 16 December 2018 the 2018 Mug of Mugs will be played with an early tee off from 7:00 and the Golfers are: Marius Muller, Merwin Rabe, Tienie Muller, Dieter Meyer, Deon van Dyk, Henrico Corbett and Fanie van Wyk. The current mug of mug champion is Tienie Muller. Our family day is planned for the Thursday 27 December 2018, and is to be played at Simbithi GC with lunch afterwards at Siggi’s at Salt Rock. We have booked for three fourballs and early tee-off from 07h40 , 07h50 and 08h00. We have 4 spots available for the first tee at 07h40. Cost R 500.00 per golfer for golf, cart and competition. To book please contact Piet 0832691661. Please also let us know about families joining for Lunch as we need to book.